Eliminate repetitive actions. Create shortcuts that perform an action or sequence of actions which can be launched by hotkey, menu, timer, event or USB. Save time, typing and hundreds of clicks everyday. Avoid carpal tunnel, do less and accomplish more. Help by Adam Engst included. Adam C. Engst is the author of the “Take Control of yKey” Manual. His manual helps you install yKey and provides a step by step usage tutorial for this essential software. Adam started the TidBits newsletter and has written numerous technical books, including the best-selling Internet Starter Kit series, and many magazine articles. Works with KeyCue which gives quick access to all your hotkeys. Fran Cotton’s in depth tutorial shows why yKey is essential for using Ableton Live 9. This is essential if you work and spend a lot of time with audio. Includes discount for yKey. More Ableton Live and yKey techniques here. Ben Waldie’s tutorial is a great intro to yKey as automation/macro software. David Pogue discusses automation/macro software and in his weekly video he says yKey is his favorite. Are you a slave to your computer? We love our computers, but we are all familiar with the fatigue of repetitive tasks. We know computers are very capable of dealing with repitition, but there has been no easy way, up until now to collect them and pass them on to the computer to perform. Now, luckily on the Mac there is yKey. Free your self from the ball and chain of repetitive drudgery. Rule your computer, don’t be a slave anymore use yKey. A simple example of how yKey can save you time! Say you open Safari each day and go to the same 8 websites and then copy some text which you email to someone. Instead of performing this same task each day for 15 mins with typing and clicking and opening and closing applications do it with yKey via one hotkey or menu item and let it work in the background while you do some other work or have a cup of tea. Seriously, why sacrifice your life to monotonous repetitive actions when your computer can do them for you. Do less and accomplish more with yKey. yKey adds an essential but missing element in Mac OS X, automation! yKey will save you and your company precious time and energy. Its all about efficiency, we call this “doing less and accomplishing more.” yKey can turn some repetitive action that might consist of thousands of mouse clicks (in various applications, in menus and different dialog boxes) and pages of typing into one yKey shortcut that can be launched anytime to perform the exact same action with a simple key press. Learn more about shortcuts in our overview section. yKey is an automation utility, a program that creates shortcuts to accomplish repetitive tasks. 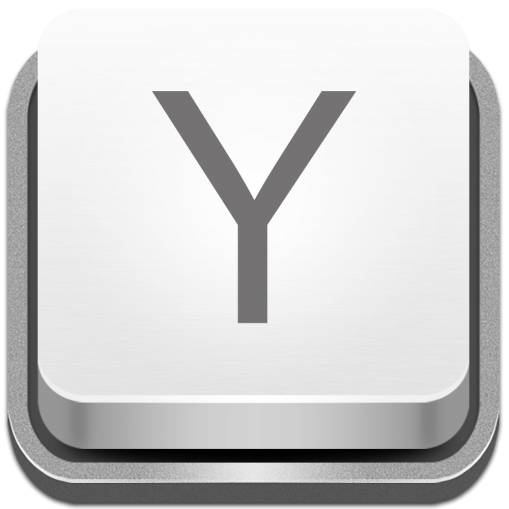 In essence, an yKey shortcut is a little program in its own right, but you don’t need to know the first thing about programming to create an yKey shortcut. All you have to do is put together three necessary parts of a shortcut: One or more commands that give the shortcut its functionality, a context in which it runs, and a launcher that defines how the shortcut is activated. A command is the action, or series of actions, that you want yKey to perform. An example of a command is: Open Photoshop and start a new document. The context is from where your shortcut can be activated. Most commonly the context is set to universal so that it will work regardless of which application you are in. However you may wish to set a hotkey for use only in Photoshop, in this case the context would be set to Photoshop. A launcher is what activates your shortcut. Most commonly it is a hotkey or date time event. For example launch Safari by pressing option + s or have it load for you at 8:00 am each morning. Use yKey to tell your computer to launch, switch, show, quit and relaunch software applications, or to open specific documents even in other applications than their creator application. Includes access to recent applications and the currently running applications. yKey is even able to control the actual windows & menus of running applications. ‘Option’ + ‘g’ takes me to Google in a new window. ‘Option’ + ‘s’ loads Safari or brings the most recent window to the front. ‘Option’ + ‘i’ loads imageReady and opens a new document. Switching between applications has never been so easy and fast. My task list is never ending. At the beginning of the day it loads as part of a sequence, along with my email, cnn.com, and the ebay items that I have been tracking. To check my list during the day, I just press ‘option’ + ‘shift’ + ‘t’ and it comes to the front of my desktop. Formatting documents can be tedious. You can have several fonts, sizes, colors, and alignment configurations. I have used yKey to set hotkeys, which only work within MS Word, that streamline my formatting. Copying, Pasting and adding to the clipboard is all possible with yKey. yKey can open the System Preferences and switch to any one of the preference panes. yKey can tell the computer when to sleep, restart or shutdown. Using the power of Mac OS X, yKey can even execute UNIX commands. I use yKey to back up my hard drive while I am asleep. But when it’s done, I like to have my computer go to sleep so that I can save energy. yKey can take care of all of this, what a revolutionary piece of software! Its great to see how my websites look on different computer setups and screens. Adjusting the system preferences each time I do this gets tiresome. Now I can automate this to switch back and forth with a single click. yKey can simulate both keydown events and mouse events, meaning yKey can control the computer as if someone were physically using the keyboard and the mouse. The keyboard commands also include the ability to type the date, type the contents of the clipboard or even the contents of a file. In Flash MX there is no hotkey for inserting a frame into a layer. As opposed using the mouse each time to do this, I used yKey so that it selects ‘insert frame’ from the menu when ever I press ‘option’ + ‘shift’ + ‘f’. I set the context so that it only works within Flash, so that this key is available for other applications. Uploading files to my server can be tedious, especially when I am using PHP, which requires me to frequently edit, upload, and test. The secure FTP software that I use requires me to drag the files from my finder in order to upload. I have set a shortcut in yKey so that when I hit ‘ctrl’ + ‘shift’ + ‘u’, my computer opens finder and my ftp client, and then simulates the mouse movements required to organize the files according to date and then drag the files to my ftp client for upload. yKey is also able to Open Web Addresses, Create new e-mails, Pause, Display folder hierarchy and show files within the Finder, play Sounds, and execute Applescripts or itself be run by Applescripts. Keeping track of competitors, industry news, and our search engine ranking is crucial for our company. For this I use Google alerts, an amazing tool in itself. But what is even more amazing is that I have customized yKey to automatically email each relevant Google alert to all our partners. What I used to spend an hour a day doing, is now done all by itself. I have used yKey to alert me with a variety of sounds depending on the tasks at hand. If I have iChat conference at twelve in my calendar, then yKey will play sound a trumpet, open iChat, and connect me to my bosses. Michael Hyatt – International Leadership 7/5/11 Describes his use of yKey to boost productivity. [fix] Prevent crash when some calendar events occur (often appeared to be a crash when waking or a crash when open for a while). [fix] Resize window commands now work again for recent macOS versions. [fix] Fix some horizontal scrolling bugs and generally make the window scrolling actions more reliable. [fix] Fix some image problems in the yKey Editor, particularly where some icons were flipped. [mod] New name: iKey is now yKey! [mod] Removed the need to run as an admin user, in line with modern security practices. [mod] Improved the way yKey handles standard window buttons (like close, minimise, zoom / full screen). [mod] Clean up registration menu items after registering. [mod] yKey configuration is now saved in and loaded from a more standard system location. Previous configurations are migrated when starting this new version. [mod] Preferences shared between editor and yKey engine are now organised better. [mod] Lots of internal improvements and modernisation. [mod] Updated code signing to Apple's latest requirements. to do this (you can still change your mind via the preferences). [mod] Removed some stale web links (times change and so does the web). [mod] Removed the "configure for all users" feature. Again, opening up the system to sharing configuration information amongst multiple users is no longer an acceptable practice in the modern security-conscious world. Configurations can still be shared by exporting and importing, but we all like to personalise our configurations anyway, don't we? [mod] Removed editor support for auto-wake after sleep. OS X has not supported this since OS X 10.5. [mod] Removed support for converting iKey v1 preferences since v1 was replaced over a decade ago. [mod] Removed support for .Mac service backup "quick picks" since Apple has retired the .Mac service. [New] Developer Signed Application, library and frameworks. [Updated] Clean up code base (upgraded may legacy calls & less log messages) and removed unused/old code. [Updated] Now prompt on startup to give iKey access to Security -> Privacy ->Accessibility to allow it to control your computer. - More updates and new features coming. - Thanks to all users for the feedback. [Add] - log entry if keyCue is not running. [Fix]- assorted bugs in preparation for a major future release. [Updated] - the location of the bin file from script software to plum site. [fix] editor hot key did not show correctly in 10.5.8 when running in 64bit. [fix] adjusted for new mac os behavior so 32bit works correctly and automatically for pre 10.6 and 64bit for 10.6 and higher also works correctly. [mod] Added USB Tracing for extended support of new XKey (a particular usb device with multiple keys, joy sticks, jog and shuttle) devices. Details for users of the new xkey and who need this: to enable in command line enter: defaults write com.scriptsoftware.ikeyeditor debugTraceUSB 1 Then send iKey Editor logs to support. [mod] works with multiple monitors. can move windows to a negative location. monitors to the left are considered negative. [mod] install no longer opens manual at end of install. [fix] version 2.4.3 did not open for new users. this new prefs issue fixed. [fix] Fixed spelling and improved feedback for failed registration keys. [mod] install now allows you to select custom location. [mod] removed Authorize option from File menu of editor for security reasons. note: this affects the Wake from Sleep option only if you enable Accessible device support. sleep command with no wake option still works. [mod] email feedback now report "I'm running iKey 2.4.0 under Mac OS X 10.6.2 (Intel 64)." [mod] Added user default for Action editor framework "IKActionDebug" for login actions editing. [fix] Could not find image named 'cursor'. [add] Added open folder options to Folder Commands..
[fix] folder heirarchy locking up fixed. [fix] Fix: iKey Editor Console *** WARNING: Method setDrawsGrid: in class StripedTableView is deprecated. It will be removed in a future release and should no longer be used. [mod] Updated Mount server to clean up issue, now uses UTF8 for internation support. [mod] unix updated tool tips for Run in Terminal and Edit. [mod] unix command now returns "unix command return error #" if error ocurrs. [add] Added Tools tip to menu if only icon displayed. [fix] fixed sound up, down and mute. Now works regardless of keyboard type. [add] Add Sound->Max Volume command. Set volume to Max value. [mod] fixed removing or adding image / title to menus. [fix] fixed bug were 2nd identical action in a menu or pallete would not add. [Add] Fully 64 bit including all modules when using 10.6. This means it will run faster and use less memory. [Add] New module to easily control iClock. yKey is mentioned at 00:03:5 into this great podcast with Dave Hamilton at MacObserver.